Nick and Priyanka Chopra have been gracing the headlines lately as details of their glitzy wedding ceremony at Jodhpur’s Umaid Bhawan Palace make their way to fans. The pictures that have been shared on the social media have set the internet ablaze as fans can’t stop but gush over the unique bond that the newly-weds share with each other. 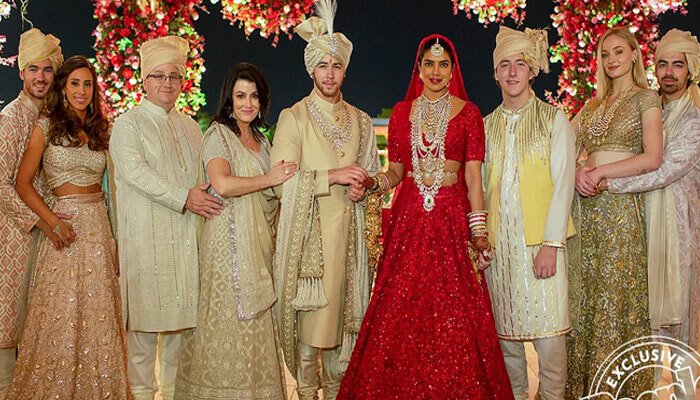 The wedding, which was an intimate affair, saw the attendance of Nick Jonas’ family members that had flown to India to be a part of the Indo-western wedding ceremony specially. Paul Kevin Jonas, Denise Miller-Jonas and brothers, Kevin, Joe and Franklin turned up at the nuptials. Opening about the grand, fairytale-like wedding ceremony in an interview, Nick’s brother Joe Jonas described the ceremony as ‘’the most beautiful wedding he had ever attended’. He also went on to add that the wedding was indeed a special one as it entailed a lot of emotions and tears, as well as smiles for everyone. The couple who had a royal western and Indian wedding on December 1 and 2 respectively are looking forward to host another reception on December 20 for their friends from the Hindi film industry.